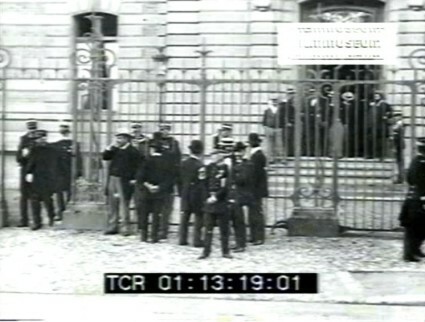 Scene outside the court room at Rennes, probably showing chief prosecution witness General Mercier on the left, from the Société Française de Mutoscope et Biographe Dreyfus trial scene film, courtesy of Filmmuseum, Amsterdam. 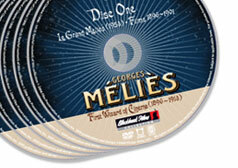 Part one of this series covered the early films of the Dreyfus affair made by Georges Méliès; part two completed the picture with the early films made by Biograph and Pathé. This final post supplies a plain filmography, for reference purposes. It includes a film by Lubin which was overlooked for the first two posts. It is arranged by film company. It does not include post-silent era productions. Impersonation. Quick-change artist Amann impersonates first Emile Zola and then Alfred Dreyfus. Comic sketch/advertisement. A tramp and a billsticker come to blows while the latter puts up a notice saying ‘Have You Seen the Mutoscope’. There are several posters advertising the Palace Theatre and the Biograph/Mutoscope, two of which mention the Dreyfus films. Description: French descriptions taken from Pathé Frères 1897-1899 catalogue; English versions taken from The Era, 21 September 1899. Actuality. Several scenes filmed at Rennes during the time of the Dreyfus re-trial, including fleeting views of Dreyfus himself and several of the major participants in the drama. Scenes at Rennes in front of Lycée court building. Carrying out evidence in a basket? Various presumably notable figures exit the main gates. Carriage arrives outside the Lycée for woman, presumably Lucie Dreyfus. Large gathering of military officers. Guards on foot and on horseback lined up outside Lycée with their backs to a figure who comes out of the building (presumably Dreyfus) and passes by (view obscured) to left, with rapid panning shot. Possibly General Mercier standing by the main gate to the Elysée. Dreyfus’ lawyer Fernand Labori may be in this scene as there are reports of British audiences cheering Labori and booing Mercier. Large crowd (probably journalists) coming out of a doorway during the trial, some of whom recognise the camera. View from above of the prison courtyard showing Dreyfus and an accompanying officer walking out of one door and in through another. Sequence repeated. Title from London Palace Theatre of Varieties programme, 21 August 1899. Lucie Dreyfus and her brother-in-law Mathieu Dreyfus walking along street, with panning shot. Title from London Palace Theatre of Varieties programme, 21 August 1899. Figures leave court room including Dreyfus (only half-visible) past the guards on foot and on horseback all with their backs turned. Dreyfus followed as he passes to the left by panning shot. Guards then disperse. Title from Manchester Palace Theatre of Varieties programme, 4 December 1899. I forgot to comment on part three. Thank you for gathering all this information. The Dreyfus affair was a hot story that went on for a long time. Perfect for generating movie ticket sales. Thank you as always Joe for your comments. I think you are the Bioscope’s loyallest and longest-serving reader. Oddly, I’ve never seen any of the sound era Dreyfus feature films – not even The Life of Emile Zola – but I wonder how much they sold tickets, aside from Zola which we know was a big hit. I think the story appeals to filmmakers, but that it may be hard to get the passion into a story which needs to pack in all the historical baggage as well. Unless you’re Georges Méliès, of course.